Best Execution: Is this regulation necessary? ; Fundamental issues; Putting it together- Elements of a sound best execution policy; Comparing approaches; A legal approach; Technological considerations; Market Integration: Liquidity, Market Fragmentation and Price Formation; Fragmentation and Concentration; Clearing and Settlement; Old Solutions to New Problems- Historical Attempts to Integrate Markets; Making Integration Work- The European Case; Making Market Integration Work: State vs. Market- Who regulates the integrated market? ; Conclusions. Best execution, market integration, and other major financial market issues have traditionally been dealt with as separate matters requiring individual solutions. 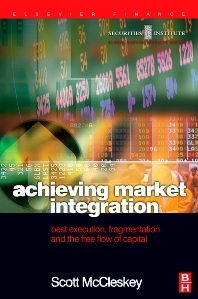 In Achieving Market Integration the author demonstrates the interrelated nature of these and other imperative problems, and sensibly reduces them to their common fundamental principles. Beginning with an in-depth examination of best execution in today's multiple-market environment, the book moves logically into an examination of market structure and the problems of achieving genuine integration. The book makes the case that order interaction is fundamental to addressing each of these issues, and develops a unified regulatory approach to achieve true market integration based on intermarket linkages and a cross-market best execution policy. This unique approach culminates in a coherent set of policy recommendations and an innovative framework for assessing the effectiveness of future policy proposals. Scott McCleskey is Director of Public Regulatory Policy at Virt-x Exchange Limited, the pan-European stock market which is home to trading in Swiss blue chip equities. He has previously worked in market regulation and compliance roles in the UK, continental Europe and the United States, having begun his career in financial services as a retail stockbroker. He holds a Master’s degree in Financial Regulation from London Guildhall University and is pursuing an advanced degree in International Relations from the University of Cambridge.